The team released a noncommittal statement after the vote Friday night. Who says no to $38 million? Someone seeking $48 million, certainly, but that doesn’t appear to be quite what’s going on here, since the PawSox owners already okayed a $38 million contribution previously. One possibility is that they’re concerned they could end up on the hook for more than the $45 million they were willing to put in (with the help of naming rights money and any other new stadium revenues, of course, since they’d get all those and the city and state would get squat), as a Senate Fiscal Office analysis projected that capping the public’s commitment to repay the stadium bonds could result in higher interest rates that would increase the total borrowing cost by $55 million to $87 million, which ain’t chicken feed. Still, let’s not let the fact that Larry Lucchino & Friends think this is a crappy deal for them lull us into a false sense of security that this isn’t also, and much more certainly, a crappy deal for the Rhode Island public. State and city taxpayers are about to be forced to draw a circle of indeterminate size around a PawSox stadium site, and agree to hand over all property taxes from inside the circle to the team’s owners; if that doesn’t come to $38 million, the city development authority will have to find a way of making up the shortfall. And all this only because the team owners keep making vague threats to move to a city that hasn’t revealed publicly any offer at all in the way of stadium subsidies. 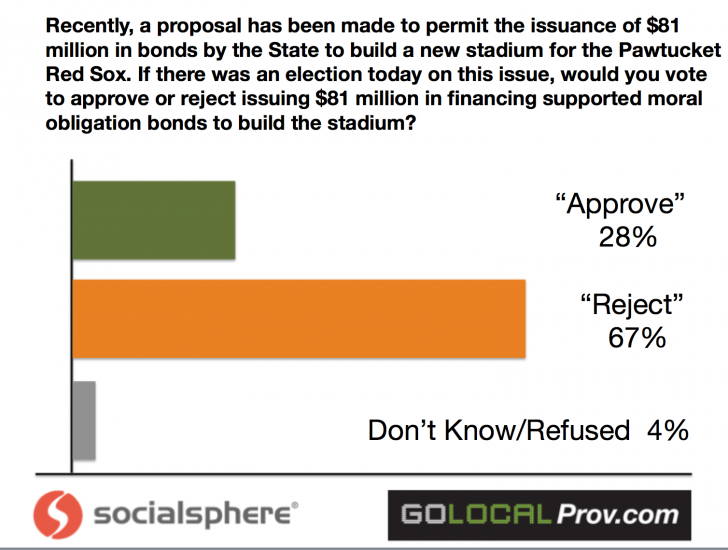 And all over the objection of local residents who appear to overwhelmingly oppose the plan, just because in eastern states like Rhode Island, elected officials can broker stadium deals like this without fear of citizens staging a voter referendum to overrule them. That’s bidding against yourself in the worst way — and all for a team that the city could just go out and buy (or buy a replacement for, if the current owners really insisted on moving) for a fraction of the cost of helping build a new stadium, something that on the minor-league level is actually allowed. The best hope now is that by tweaking the financing of the subsidy, the legislature will have made it equally awful for the team owners, creating a kind of poison pill to save elected officials from themselves. That’s a slim reed to cling to, but if you’re a Rhode Island resident — or a fan of historic ballparks, of whom there are more than a few — right now it’s all you’ve got. This entry was posted in Pawtucket Red Sox, Uncategorized by Neil deMause. Bookmark the permalink. Not hopeful on this one… Lucchino and co seem to have successfully moved the debate from “should we spend any oublic money on this” to “is this enough money for you guys to agree to take it”? And, very importantly, they have managed to win the “last minute legislation” sweepstakes. 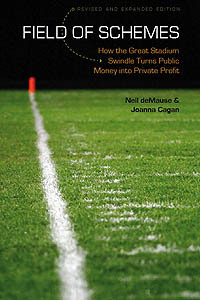 It’s not only ballparks that benefit from these sleazy tricks… this type of tactic has been used in everything from the “Greek” bailout (in which almost no money goes to actual poor Greeks, but to German, French and other banks) to the Heathrow airport expansion, or any Olympic games or World Cup. Until we find a way to deal with “No” not being binding but “Yes” very much being the opposite, I don’t know how we address this. Certainly it’s understandable how a “yes” answer to any contractual agreement creates binding obligations. The question is, why doesn’t “no” carry the same certainty? I’m not seeing the connection to the Greek bailout. Greece was defaulting on their loans. That’s a big problem for everybody–the lenders get stiffed, the overall economy in the EU takes a hit, Greece can’t secure additional loans, etc. The bailout basically resets everything so that hopefully Greece does a better job in the future. There was never any intent to give bailout money directly to the Greek people, nor should there have been. That’d be like you begging your buddy for $500 to keep your car from being repossessed then turning around and complaining that none of the $500 went to buying Christmas gifts for your kids. You may not see the connection, but it exists. Greece was defaulting on loans made based on false information (and there’s plenty of blame to go around on that front, from the weak and inaccurate information the Greek gov’t provided to the EU, to the weak and pathetic efforts the EU itself did to verify the info provided. Both bureaucracies were intent on EU extending membership to Greece, come hell or highwater). The bailout does nothing to address Greece’s fundamental inability to pay back the loans (the new debt carries fees and interest every bit as egregious as the original ones did, only moving the deadline further down the road), nor does it spur the Greek economy in any way (quite the opposite, in fact, as money that should be in circulation is syphoned off to repay bloated and incompetent European banks, and revenue earning public assets like ports and rail infrastructure were ordered sold off at the behest of the bailout experts – almost certainly to associates of the bailout experts themselves – leaving the nation with even less self generated revenue than before). It is the IMF “lifelong supportable debt” model we so proudly extort the rest of the world with. There absolutely WAS an intent for the loans to spur the Greek economy and raise the standard of living for all Greeks. In fact, they did no such thing… very much as new stadia do not make the Buffalos or Pittsburghs of the world sports landscape any more equal to New York or Chicago franchises. What Greece was enticed to do (and, at least initially, willingly accepted) was take out large loans they could never hope to repay, then use that capital to make payments on those loans until there was no capital left. It is in every way like taking a second mortgage on your house to pay last months overdue gas & electric bills. In the end, Greeks did not get an expanded economy or growth, what they got was a period of ‘imagined plenty’ and economic contraction, brought to a head when the money ran out. You can ask Hamilton County, Ohio; Glendale, Arizona; Cobb County, Georgia or any number of other districts about that sort of feeling. The promised benefits of massive borrowing did not manage to cover the carrying costs (and sometimes no benefit shows up at all), leaving the intended beneficiaries far worse off than before. On street corners, we call this the drug dealer model. The first little bag is generally free, because the customer is “a good guy”. For bankers, stadium builders, franchise owners and associated carpet baggers, these programs work fantastically. Most of their money is made up front and, with the exception of the bankers, they are long gone when the accounts run dry. Fortunately for the bankers, we capitalists no longer hold them responsible for their colossal professional errors… we bail them out with additional taxpayer funding and, as often as not, allow them to use the bailout funding to pay themselves bonuses. Greece has no one to blame but themselves. You sound like my sister rationalizing up reasons why the car she bought 6 years ago getting repossessed is somehow the bank’s fault. I didn’t even know it was possible to refinance a car. They took out a bunch of loans, lived extremely fat and happy to where they would have been otherwise. And then cried cried cried when the bills came due. They deserve zero pity. Not that the banks who lended to them the money deserve any either. I have no dog in this fight. Having said that the question is, is Pawtucket better off without the Paw Sox or better off with them.. I would argue that Pawtucket is more famous for Hasbro toys than the PawSox. I wonder to what extent Hasbro will be funding this? If the Red Sox want to keep a team in New England, there aren’t a lot of other options, given the small size and general fiscal stress on towns and states. Portland (which has already struggled at the AAA level) is one, Providence (which didn’t work out) is perhaps another. A team in Montreal might allow some satisfaction after Boston being crushed by the Habs for so many years.